The first weekend in November brought me a couple of days to “play” in the kitchen; some time to try out some new things for Thanksgiving. I’d surveyed several recipes for pumpkin cheesecakes and decided the one from The Brown Eyed Baker looked most promising. I was especially curious about the crust made with ginger snaps since I’ve been known to cruise through most of a bag of those things with a glass of milk. I prepared the cheesecake on Friday evening and then set in the refrigerator to ‘cure’. On Sunday afternoon around the table with several friends, this pumpkin cheesecake made its appearance and did not disappoint one little bit. Preheat the oven to 350 degrees. Double-wrap the bottom and outside of a 9-inch springform pan with heavy-duty foil making sure the water bath to come will not seep into the pan. Take your time making sure you’ve done this well. Mix together the ingredients for the crust and press them into the bottom of the springform pan. A good way to do this is to take a drinking glass and using the bottom, lightly tap/pat the crust evenly into the pan. Bake for 6 to 8 minutes, or until lightly browned. Remove from oven and cool completely. Reduce oven temperature to 325 degrees F.
Bring a pan of water to a boil for a water bath. Beat together the cream cheese and the sugars on medium speed until smooth and creamy, scraping the sides of the bowl as needed, about 3 minutes. Add the pumpkin and mix on low until completely mixed. Add the eggs one at a time, beating well until fully incorporated and scraping down the sides of the bowl between each addition. Add the heavy cream and vanilla and beat until well combined, about 1 minute. Add the cinnamon, ginger, salt, nutmeg, cloves and allspice and mix on low to mix well. Pour the batter into the prepared crust. At this point you will firmly but carefully tap the pan on the counter to release any air bubbles. Place the pan into a larger pan (a roasting pan works really well for this) and pour the boiling water into the larger pan until it is about halfway up the springform pan. Bake for 55 to 65 minutes or until the edges are set, but the middle still jiggles a little. Do not open the oven door at any point in this process. Keeping the oven door closed, turn off the oven and let the cheesecake rest in the oven for 1 hour. After 1 hour, remove the cheesecake from the oven, carefully remove it from the water bath, remove the foil and place the cheesecake on a wire rack to cool completely, about an additional 2 hours. 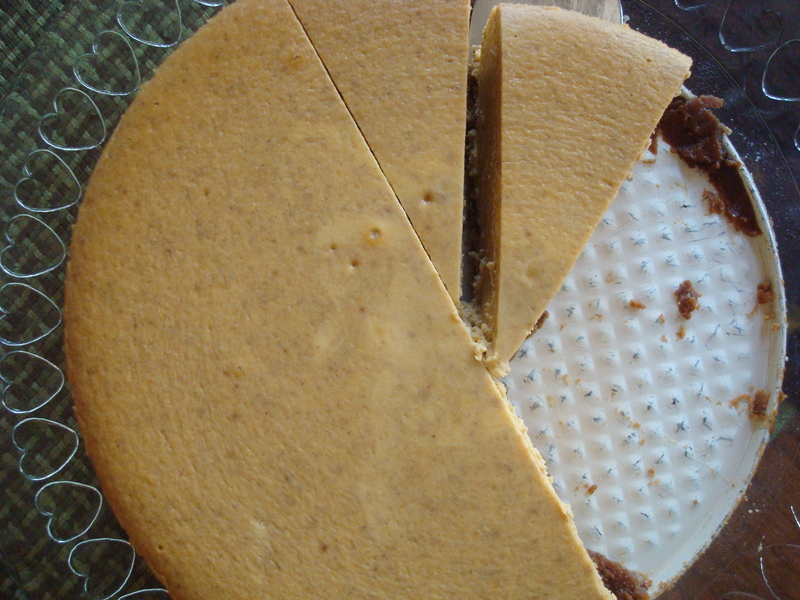 Once the pumpkin cheesecake is completely cool, cover and refrigerate for at least 6 hours. It’s best to let it set overnight. You may want to garnish with a light sprinkling of crushed ginger snaps. Serve and enjoy! Subscribe to comments with RSS	or TrackBack to 'Pumpkin Cheesecake'. I think I’m officially off my diet after reading this. Perhaps that will be my Friday evening this week! I’m giving you permission to suspend any dieting for this specific recipe. Pair this with a pumpkiny beer you’re brewing and you’ve got two or three of the major food groups covered!